WHY IS A WATER INTRUSION INSPECTION NECESSARY? There are many types of mold, and none of them will grow without water or moisture. While there are always organic food sources in a home, damp or wet conditions provide a favorable environment for fungal/mold growth. It is critical to identify and address the underlying cause of the mold growth, namely the source of the water or moisture, or the growth could reoccur in the future. Molds are usually not a problem indoors unless mold spores land on a wet or damp spot and begin growing. Molds have the potential to cause health problems. Molds produce allergens (substances that can cause allergic reactions), irritants, and in some cases, potentially toxic substances (mycotoxins). Inhaling or touching mold or mold spores may cause allergic reactions in sensitive individuals. Allergic responses include hay fever-type symptoms, such as sneezing, runny nose, red eyes, and skin rash (dermatitis). Allergic reactions to mold are common. They can be immediate or delayed. Molds can also cause asthma attacks in people with asthma who are allergic to mold. In addition, mold exposure can irritate the eyes, skin, nose, throat, and lungs of both mold-allergic and non-allergic people. Symptoms other than the allergic and irritant types are not commonly reported as a result of inhaling mold. Research on mold and health effects is ongoing. For more detailed information consult a health professional. You may also wish to consult your state or local health department. It is impossible to get rid of all mold and mold spores indoors, some mold spores will be found floating through the air and in house dust. The mold spores will not grow if moisture is not present. 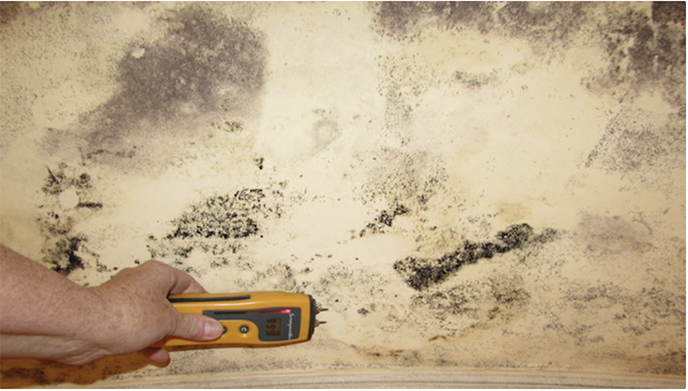 Indoor mold growth can and should be prevented or controlled by controlling moisture indoors. If there is mold growth in your home, you must clean up the mold and fix the water problem. If you clean up the mold but don’t fix the water problem, then, most likely, the mold problem will come back. Who should do the cleanup depends on a number of factors. You should consider the location of the mold (for example, a shower stall or a wall surface), the amount of surface area affected, and the type of building materials affected. If there has been extensive water damage or if removal of any building materials is expected to be required, consultation with a qualified remediation professional is usually best to ensure that mold spores are not inadvertently spread through other parts of the home. If you choose to hire a contractor (or another professional service provider) to do the cleanup, make sure the contractor is certified by the Indoor Air Quality Association (IAQA, www.iaqa.org) and/or the Institute of Inspection, Cleaning & Restoration (IICRC, www.iicrc.org). If you suspect that the heating/ventilation/air conditioning (HVAC) system may be contaminated with mold (it is part of an identified moisture problem, for instance, or there is mold near the intake to the system), consult a qualified mold remediation or duct cleaning, contractor. Do not run the HVAC system if you know or suspect that it is contaminated with mold – it could spread mold throughout the building. If the water and/or mold damage was caused by sewage or other contaminated water, then call in a professional who has experience cleaning and fixing buildings damaged by contaminated water. If you have health concerns, consult a health professional before starting cleanup. HOW DO I KNOW WHEN THE REMEDIATION OR CLEAN-UP IS FINISHED? WHEN IS TESTING OR SAMPLING FOR MOLD NEEDED? Air samples are often used as a method of determining if hidden sources of mold exist. Air samples are also needed by Industrial Hygienists and other professionals when assessing and determining the scope of a mold remediation project. Air samples also provide a baseline for comparison when work is completed; clearance testing should always be performed after any professional remediation work is complete to ensure that a normal fungal ecology exists in the remediated area. supply information necessary to determine the extent of a remeare also Surface sampling may be useful to determine if an area has been adequately cleaned or remediated. Sampling for mold should be conducted by professionals who have specific experience in designing mold sampling protocols, sampling methods, and interpreting results. Sample analysis should follow analytical methods recommended by the American Industrial Hygiene Association (AIHA), the American Conference of Governmental Industrial Hygienists (ACGIH), or other professional organizations. WHAT ARE SIGNS THAT I HAVE MOLD? You may suspect hidden mold if a building smells moldy, but you cannot see the source, or if you know there has been water damage and residents are reporting health problems. Mold may be hidden in places such as the back side of drywall, wallpaper, or paneling, the top side of ceiling tiles, the underside of carpets and pads, etc. Other possible locations of hidden mold include areas inside walls around pipes (with leaking or condensing pipes), the surface of walls behind furniture (where condensation forms), inside ductwork, and in roof materials above ceiling tiles (due to roof leaks or insufficient insulation). CAN I INVESTIGATE HIDDEN MOLD PROBLEMS?